[ March 24, 2013 – ExoNews.org/Examiner.com/Exopolitics.org] A video recording from President Obamaâ€™s address at the 2012 AIPAC conference at the Washington Convention Center shows a mysterious looking figure among the Secret Service agents protecting him. From one camera angle, the figure looks uncannily like a tall Gray alien; with no noticeable ear, mouth or facial hair. From most other camera angles, the figure appears as a bald Secret Service agent who looks human enough. Not so according to a popularYoutube video that has over 330,000 hits since its March 13, 2013 release. The bald Secret Service agent is a shape shifting humanoid alien, and the video provides detailed analysis supporting its remarkable claim. So was it all just a trick a light, or did the camera capture something we werenâ€™t supposed to see? In the 1988 science fiction movie classic, They Live, extraterrestrials live among humanity using advanced technology to hide their physical differences. 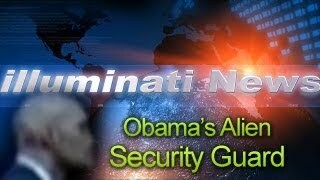 Is it possible that the Secret Service employs aliens to protect President Obama, and uses some kind of advanced technology to hide them from the public eye?